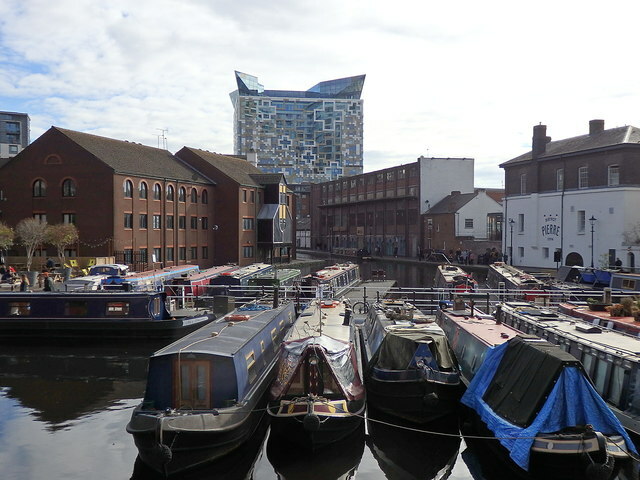 The two rows of narrowboats are separated by the Worcester Bar, the barrier between the Birmingham Canal Navigation (BCN) Link and the Worcester and Birmingham Canal (W&B) side of Gas Street basin. Until 1815, it was necessary to transship goods across the bar as there was no physical connection between the two canals. From 1815 to nationalisation in 1948, the two canals were connected through a bar lock (out of shot to the right) to prevent loss of water from the BCN to the W&B. Nowadays, the lock gates have been removed and boats can pass freely through the lock. The tall horned building in the background is The Cube, opened in 2010 as part of the Mailbox development. It contains flats, a hotel, shops and restaurants.